We’ve told you how valuable promotional products can be for marketing your business. With Pinnacle Promotions on your side, building your brand couldn’t be easier. Once you’ve decided that you’re ready to take the plunge into the realm of promotional products, there are so many options that are available to you, from type to print style, to color. When you don’t have much time to get the high quality and affordable custom branded promotional products that your business needs ready for your event, we have you covered. 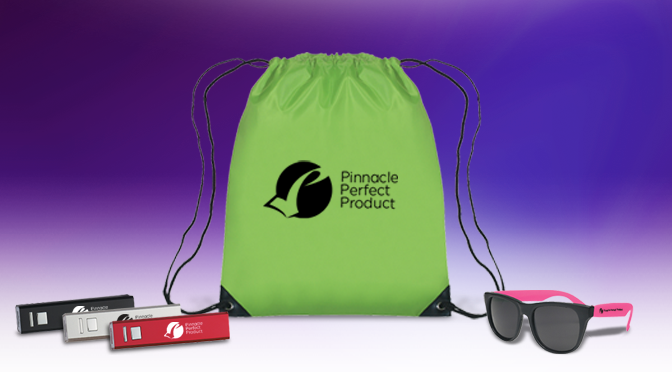 Enter Pinnacle Perfect—our most popular promotional items, with simplified swag options at factory direct prices. With Pinnacle Perfect products, you won’t have the hassle or hesitation, as these products have quick turnarounds backed by our Pinnacle Platinum Guarantee. Your marketing may not be perfect, but to help you get there, there’s Pinnacle Perfect. These schwag products span across different categories from drinkware to bags to office accessories and more. It’s just a matter of finding what works for you. For example, Pinnacle’s take on the classic white coffee mug has proven to be a simple, yet extremely effective takeaway piece for customers, as they have a way to remember your brand each and every day, while sipping their favorite beverages. As an added convenience, this ceramic mug is microwave safe with a comfortable handle. Then, with your branding cleanly printed on the front of the mug, you will be ready for your next event! We’ve got some perfectly fun and still useful swag like these LED Key Tags. These custom branded LED key tags come in four bold colors and even include batteries. The LED feature coupled with custom branding certainly takes it up a notch not just in terms of appearance, but also in terms of marketing power. In this age of technology-obsessed consumers, it is a great time to take advantage of the marketing opportunity available. Pinnacle Perfect Metallic Powerbanks can be screen printed or laser engraved with your corporate logo, adding some energy not just to devices, but also to your marketing. With a sleek finish and a choice of four vibrant colors, you can appeal to consumers, as well as add some personality to your brand. Believe it or not, your company has tremendous marketing potential. With Pinnacle Perfect products, you don’t have to jump through the hoops to achieve success. In terms of utilizing schwag and custom products, don’t get bogged down by the vast number of choices available to you. Follow our simple breakdown of cost-effective, immensely popular, custom promotional products, and you’re sure to Make the Right Impression™.